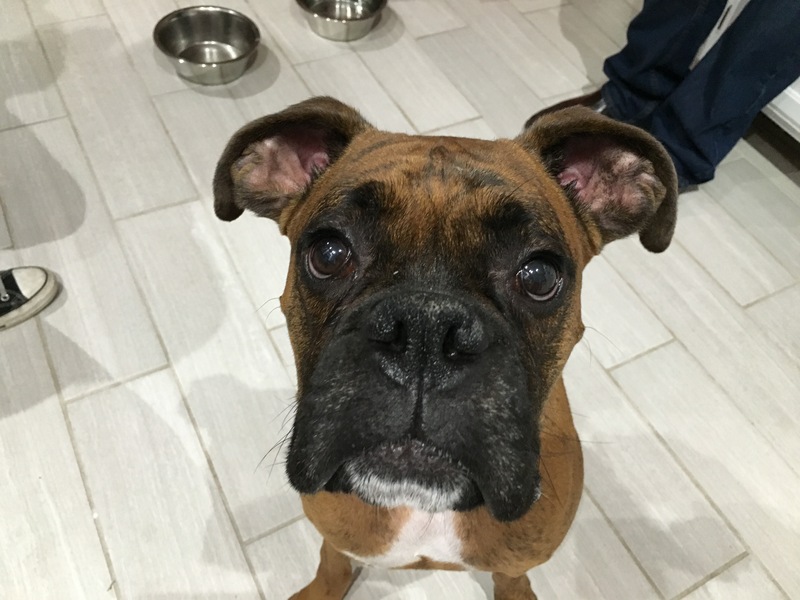 Nacho is a three-year-old Boxer who was never socialized and now doesn’t know how to interact or play with other dogs. His guardians also reported that he gets over excited and jumps up on guests when they come into his home. When I sat down to discuss the situation with the guardians, Nacho kept circling the table and getting into everyone’s personal space. When a dog shows no respect for space this way, its usually a good indicator of a dog who doesn’t have the proper respect for the guardian’s authority. A dog thinking it has more rank or authority than the humans it lives with can be a major factor for dogs who are reactive or aggressive to other dogs. To start changing the leader follower dynamic in the home, I showed his guardians how to claim they personal space. By consistently disagreeing with Nacho when he paws at his guardians or invades their personal space, his family can help the dog learn to develop a little more self control. Another way to change the leader follower dynamic is to have the dog literally in the follower position. When a dog is in front, it thinks its leading. So by simply making the dog move back and wait for the humans to go first, we can help it start to self-identify as a follower. I showed the guardians how to practice this by claiming the area around the door. Because we go in and out of doors thousands of times over the course of a dog’s life, getting into a habit of having the dog in the last position helps to continually reinforce the distinction between human and dog. It usually only takes a week or so of practice before the dog starts to stop and wait for the humans to move to the front or out the door first. Once this is the case, this activity automatically strengthens the proper leader follower dynamic without the humans even thinking about it. I had previously gone over some non verbal communication methods with the guardians and they had applied them when claiming their personal space and the door. But to help them practice this in a more direct way, I went over a leadership exercise I developed a few years ago. It only took Nacho a few repetitions before he seemed to get it. Once that was the case, I coached his guardians through it so they got the same result. By moving forward when the dog does the wrong thing and back when it assumes a less challenging position, the guardians are practicing the techniques that they will apply to communicate and disagree with Nacho in his native language. I suggested that they practice this exercise a few times a day every day until they can get Nacho to stay away from the treat on the floor for a full 20 minutes. This will allow Nacho to practice restraining himself, a crucial skill he will need to develop to get over his reaction to other dogs. Because he was dog reactive and was used to walking in front, I went over the rules I use for a structured walk; Walk next to the human instead of in front, no stopping to sniff or marking of objects. The goal for a structured walk is to have the dog paying attention to the guardian instead of exclusively reacting to the surroundings. I showed his guardians how to position a leash around his chest to calm him down and stop his pulling as well as how to hold the leash and correct when Nacho got out of line. After demonstrating how to lead Nacho in a structured walk, I handed the leash to one of his guardians so that she could practice herself. We had taken the time inside to ensure that Nacho wasn’t in an over excited state before we left the house. This small step is extremely important and one that many dog guardian’s fail to do. Nacho did outstanding right out of the gate so we swapped partners so that his other guardian could practice the same techniques. While Nacho did pretty well on his own, the second guardian allowed him to start moving ahead of him and when he stopped, the dog continued for a step or two placing him way out in front. Because dogs walking in front see themselves as literally leading the handler, this can cause a dog to become more reactive when encountering another dog. For this reason its important that the humans immediately disagree and correct the dog the instant it starts to move in front. If the correction is too late, the dog can get confused or ignore it altogether. A great thing to practice on a walk is to stop suddenly and put the dog into a sit. I like to do this so much that the instant I stop, the dog sits without being told to. When you achieve this, the dog is able to respond quickly because its paying attention to its handler. Getting your dog to conditioned to sit this way can help snap it out of a reaction before it starts. It can also have a calming effect on other dogs. Sitting is a less confrontational position. So if your dog is in a sit, that position can help the other dog react less, or not at all. As we were returning home, I showed the guardians how to turn walking up the steps to the house a simple exercise that helped Nacho learn to stay in a heel. Because his guardians will go up and down these stairs thousands of times in the dog’s lifetime, stopping and making him pace them will help Nacho learn her needs to follow them. By the end of the session, Nacho was showing much better respect for his guardian’s space and authority; even following some new rules without being reminded or corrected. Im hoping that once the leader follower dynamic has been properly established and the dog practices following on the leash, Nacho’s reactivity towards other dogs will stop. For the majority of my clients this is the case. I asked Nacho’s guardians to follow up with me in a month or so with a progress report to see if we need to schedule a follow up session. If needed, some counter-conditioning should allow Nacho to learn to be around other dogs without reacting.